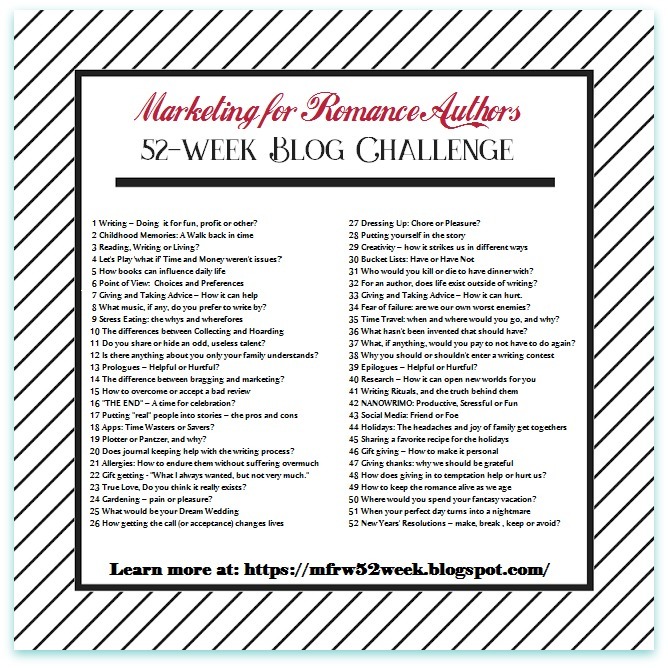 It’s Friday and I have to tell ya, it’s time for another Marketing for Romance Writers 52-Week Blog Challenge Blog Hop. Or better known to those who Tweet: #MFRWauthor. Week 25: Do You Keep a Journal or Diary? Nope, I’ve never kept a diary in the true form of what a diary should be. As a teen, I scribbled out thoughts but was always careful about what I’d write. My mom was snoopy. Throughout my life, I have written in journals. Keeping a journal is therapeutic and gets the creative juices flowing. Writing gets “stuff” out of my head. I’m a lover of pens, so having one in my hand and pressing it to paper takes me to a place of comfort. I collect pens and pretty notebooks. The prayer journal came at a time when I felt at peace with my life. My boys were growing rapidly, my marriage had been strong, and life moved on an even keel. Weird, huh? People usually do something like this when times are bad. This journal started when I began to study the Bible, and church had been a Sunday ritual. Nevertheless, the even keel began to tilt. One antsy night at my cottage in the Allegheny Mountains, I had started writing my first book—another therapeutic outlet for me. This had been started in my mind before life slowly fell apart and before I stopped writing in the journals. The more hours I put into writing my book, working full-time, taking care of a home and family, and going to school myself, the less time I had for other things—and those journals came to an end. As the keel tilted even more, the boat went under and down, down, down. Hope you don’t mind the analogy, but my mom often referred to bad times as the keel being off-kilter. Ah, but years later, the journal writing picked up again in the form of a travel journal which included lighthouse tours in and around the states and Canada bordering the Great Lakes, and traveling to NASCAR and ARCA races here and there. Eventually, and even more years later when I remarried, a new journal evolved—a romantic journal filled with back-and-forth love notes and short letters over a period of years. This is one journal I’m not ready to let go of, yet, but it’ll stay tucked away until I come across it again. Now I keep a photo-journal for images of people, clothes, animals, places, etc., links, and a future title and character name journal for my books. I’ve been using Google Keep online for a lot of my book related journal or note-taking writings. Keep syncs with my other devices. Now, I’d like to ask visitors who aren’t in the blog hop: Do you keep a diary or journal? As a reminder that this is a blog hop where other authors participate, here’s the LINK to the main page for the 52-Week Blog Challenge Blog Hop and where you’ll find links to other author blogs. I’m happy you visited here this week. P.S. A week ago I wrote Driving is Privilege. For those of you who read that post, here’s an update. Wednesday, I spent three and a half hours waiting at the Secretary of State office. Can you believe it? Guess what? If you’ve been married more than once, or changed your name, make sure to take every piece of proof you have of name changes if you want to get a REAL ID driver’s license. I received a diary with a lock and key when I was about 10. When I was 13, I had a big notebook that I wrote in a lot. I’m hoping to read that diary I wrote when I was 13 one of these days. That would be interesting. I remember thinking, when I wrote in it, that I was writing it to my older self so I would know what it’s like to be a kid! Ha! Tricky part: still remember what it’s like to be a kid after all these years! I liked reading about all the different types of journals you’ve kept. I’m always jealous of journal writers. It seems to serve them so well. Me, I get bored with my own thoughts! LOL, Jacqui, I can understand that, and I remember running out of things to say. It does take some dedication until it becomes a habit. Thanks so much for visiting. Then you get to the point in your life that you are dealing with end of life issues. Many young people don’t realize there are 2 parts to a marriage. There is the love and romance part and then there is the business side. When you have been married for over 20 years or longer things are just so intertwined. The thing is it just takes time to get through it all. Your comment makes so much sense, Duke, especially about two parts to a marriage. So true. Thanks for visiting. No problem. When you begin to talk about end of life issues people freak out. What could show a deeper love than having everything is place if you should go first? I always enjoy looking back at my travel journals and recently came across one. I miss the fun that went along with the travels and the discovery of new sights and sounds. Getting lost was sometimes the most fun parts. ❤ You won't be sorry for starting a travel journal, Diana. Good luck! interesting recount of your journals and how they’ve changed over the years. You’re not alone in the driver’s license story. I have experience with a state where it is Real Id or nothing. A neighbor who was 80+, been married and widowed four times had quite a time. And the state unilaterally decided birth and marriage certificates from certain counties were invalid due to too many being sold to illegals. Before the next renewal I had to write to three states to get updated copies of everything. good post. Thanks, Helen. Wow! It sounds like what it takes to apple for a passport. I think it says if you have a current passport, that can be used for ID, but when you get to the window, who knows what they’ll actually say. The first window had approved my documents. The second one didn’t. And, I don’t have mine yet. We’ll see what happens at the next visit. What a shame to put your neighbor though such a hassle.